Stonyfield is thrilled to team up with Non Toxic Neighborhoods and the city of North Miami, FL, to support their stellar initiatives to adopt organic field maintenance at all their city parks and fields! Read more of their story below! North Miami is a sun-soaked city, buzzing with life. Ben Franklin Park, nestled in a residential neighborhood at a K-8 school, offers basketball courts and sports fields for kids and residents to play. Recently, the city of North Miami adopted a policy to ban the use of glyphosates and other harmful pesticides on all city owned properties, including the fields at Ben Franklin Park. North Miami has a strong commitment to their community and the evidence can be seen in beautifully maintained parks, fields, and public spaces. With continued support from their city council, the people of North Miami are dedicated to consistent community-cleanups and implementation of green projects. Their commitment has reached new heights with a recent banning of harmful pesticides in favor of organic field maintenance practices to increase soil and plant health on public properties throughout the city. Ben Franklin Park is the first park to undergo the transition from conventional maintenance to organic alternatives for pest, weed, and lawn management. The insight gleaned from this park’s conversion will inform the city’s approach when implementing organic maintenance methods at its other fields, parks, and public properties going forward. 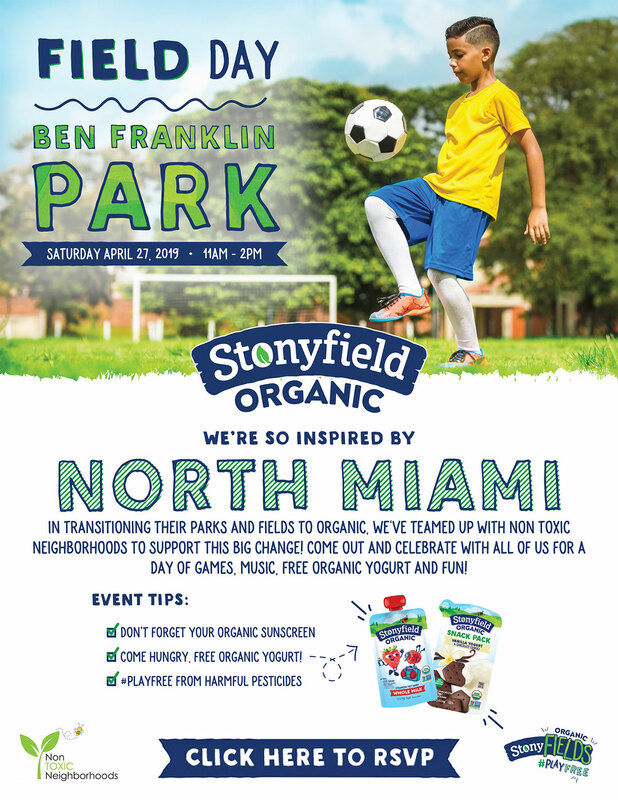 Stonyfield has made a donation to the City of North Miami to convert Ben Franklin Park to organic field maintenance over the next three years in partnership with the experts at Non Toxic Neighborhoods. We are honored to be part of North Miami’s work to make their parks places where residents can #playfree without harmful pesticides!